The Camino Real de Tierra Adentro is a 1400km section of the Silver Route stretching from Mexico City to New Mexico in the US. The route was actively used from the mid-16th to the 19th centuries, mainly for transporting silver extracted from the mines of Zacatecas, Guanajuato and San Luis Potosí, and mercury imported from Europe. The site comprises 59 different locations, including bridges, haciendas, chapels, temples, a hospital and several cities. If you've seen any of the major colonial cities, even if you've only been to the center of Mexico-City, you can tick off this one too. It's actually such a pity that the Mexicans have included these large city centers into this Camino Real-site, as it takes away the focus of what this is about. It would have been better to single out certain monuments along the way. 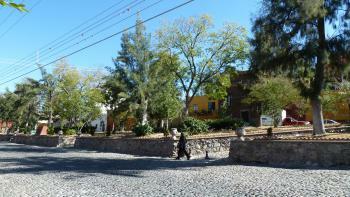 While visiting San Miguel de Allende, I made an effort to go and see the "Former Royal hospital of San Juan de Dios". 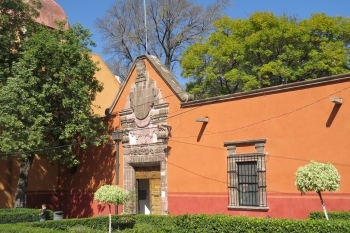 This building is additional to the area that is already inscribed with the San Miguel de Allende & Atotonilco WHS. 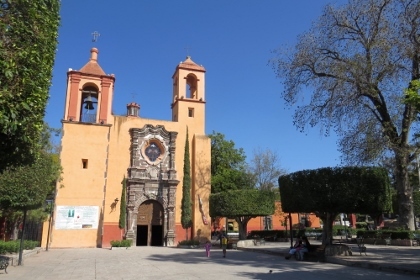 San Juan de Dios lies in a quiet and original quarter a bit outside of the city center. I was happy to find an inscription monument for the Camino Real WHS here at the little square where the church and former hospital are located. Construction of the Royal hospital of San Juan de Dios started in 1753. The "hospital" also consists of a church (of course!) and a cemetery. It was located in a strategic location at an obliged point of pass to the Tierra Adentro. It sustained all ill travelers, no matter what race they were, where they came from or how poor they were. The church nowadays is still a parish church, but the former hospital seems to have been taken over by a elementary school (although the nomination file says it has become a civic hospital). 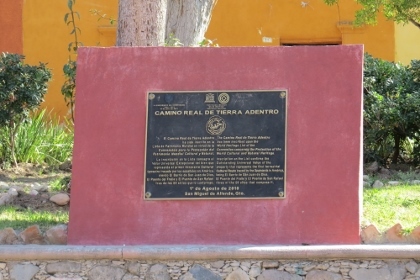 Visiting Camino Reale de Tierra Adentro – a route which probably has a history of very harsh conditions hundreds of years ago, makes you somewhat respectful. Nevertheless as an overseas traveler the knowledge of these facts is superficial, but still we would like to look into this site - at least some of the authentic places that the site comprises of - to see what it’s like today. On our three week visit to Mexico july 2017 we had singled out a number of sites on the “Camino” for potential visits, in addition to WHS cities. It’s easy to tick of this site with no extra effort, but we would like to see if we could find other parts of the old road. Three days into our visit, on our route from Tula de Allende towards Morelia, we headed to Cañada de Madero, Hacienda la Cañada and the vicinity. The gps was taking us from major roads and onto the smaller roads when we finally arrived at a location that in fact was a piece of the original road. This is now a calm part of central Mexico. We drove several kilometers of cobblestone street passing a romantic stone bridge – the Colima bridge and passed a few riding “vaqueros”. Houses and buildings along the road are hardly as old as the road, but very nice looking. Together with the lush vegetation it makes up a “picture” that really looked nice. In “the end” of the stub there was the hacienda la Cañada. The inside wasn’t accessible to us, but the World Heritage sign was right outside the hacienda. This first encounter made a good impression on us. Like everyone else, we visited the historic centre of Zacatecas, Guanajuato, San Miguel de Allende and Queretaro and they all are separate World heritage sites. In addition we stopped by Aguascalientes for lunch, and went to the Museo del Muerte. If you’re Spanish speaking and are more than medium interested in death this might be more rewarding site than it was to us. On the road from Zacatecas to Guanajuato we went to the former hacienda San Blass of Pabellon de Hidalgo. 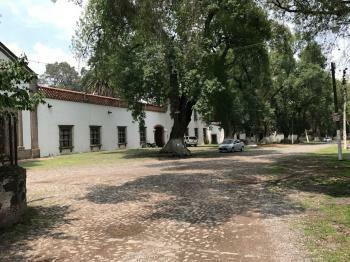 The hacienda was recently restored and is used as a museum. It includes pieces from the revolution and also several murals from the artist Alfredo Zermeño Flores, where he catches the cultural, political and social events of the last 200 years. There was also a nice collection of different types of cactuses. It was a very beautiful place to visit even though it was extremely hot. We took a few detours searching for a bridge and another part of the old road without result, but that’s part of the game. This “treasure hunt” takes time and there isn’t always enough time on the road. Outside San Miguel de Allende we visited the baroque sanctuary of Jesús Nazareno de Atotonilco. We arrived to early in the day and the church was closed. We had to return a few hours later, but it was really worth it! The church has fantastic inside decorations, is incredibly detailed, artistic and just great! The wall paintings/decorations were mostly done by the artist Antonio Martinez de Pocasangre. We also visited the hospital of San Juan de Dios, and could not see anything but the exterior. This site has also been reviewed well. The eighth site we visited was the chapel of the former hacienda of Buenavista. The Hacienda wasn’t that hard to find, but we had to drive around the Hacienda a couple of times to find the chapel. The Chapel was quite simple, but still in use. The hacienda hasn’t been in use for a while and looked liked it. Was it worth a detour? Not really! The best experience was to see the big “Patrimonio Mundial” sign outside, which even had a bronze statue of a man with a sword and a flag. Viva Mexico! With five cities and four “other sites” we have visited around one seventh of all the 59 sites. It’s far from enough but we now have a small impression of the “Camino”. The search and find activity is satisfying in itself, if you have the time. We still have more sites to visit in Mexico so we have to return one day, maybe up in the north in Durango. I was born in a small community of Zacatecas, in central Mexico, right in in the first third to "Road to Santa Fe", now called “Camino Real de Tierra Adentro” (incorrectly since in Mexico existed five or six important Real Roads). Therefore, I cannot write any description objectively. I am sure of its regional value, but I don't want to mention a possible universal value, I'm not an expert on those issues. I think everyone has to have some empathy trying to understand the love that other people have to their local places. In this case, probably in the United States the value to the road is sometimes more a political strategy or simple love to the History, maybe more like an anecdote; but let me tell you, in Mexico, this road still awakens full passions of love and genuine interest of anyone, in an inestimable way. To Mexicans, it is still an alive road (even if many sections of the original roads no longer exist): everyone living in these 10 states can narrate old legends about mines or treasure owners. Old legends about terrifying ghosts living in haciendas or anecdotes of our parents and grandparents as young travelers, old stories about passions, deadly sins or love (for example, my parents met for the first time on a pilgrimage). Old stories about apaches attacking wagons. 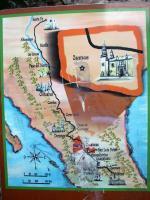 The route also arouses in some people some national sentiments: it completely coincides with the "Route of Independence": the route that followed Miguel Hidalgo to end the Conquest. Undoubtedly, there are many oversights in the nomination Mexico made to UNESCO, and I can understand it, I suppose "omission" it's a common element in all the cultural itineraries. Only 60 sites of the hundreds on the route were named (apparently those with their management plans in order) although visually I don't find big differences between those who are WHS and those who don't. It's very evident the omission of emblematic sites like Real de Catorce in San Luis Potosí, or Dolores Hidalgo in Guanajuato, although the omission is more evident in the North, forgetting all the points of Chihuahua and of course, New Mexico. Here nothing has reduced the mystical popularity of the route. For example, there is a Facebook group (extremely active, with 6000 members and up to 20 publications in a regular day) called "EL CAMINO REAL DE TIERRA ADENTRO (Antropologia, arqueologia e historia)", where people upload photos related to the route, data places, historical books and old anecdotes. Of course, the main axis of the route always was mining. As you know, mining in Nueva España was an important activity, reaching more than 1000 mining towns in northern Mexico, undoubtedly an asset that formed part of the development of the European economy; in Mexico, creating temples and rich haciendas (that cost thousands of lives of Indians and slaves). Part of the great passion that awakens the route in Mexico, has to do with the last century, and its relation with treasure hunters and wealth seekers in old mines and abandoned haciendas (curious fact, still there are a lot, a lot, of American blogs seeking to plunder abandoned Mexican haciendas). This mysticism also has to do with the great Catholicism of previous generations: the route produced the birth of the four main religious destinations of the country: Mexico City, San Juan de los Lagos, Silao and Plateros. Catholicism in Mexico has always been a symbol of pilgrimage and traveling, a symbol of migration, about "going to the North"; the route crosses the Rio Bravo (yes, before Bush, Trump and this Era of immigration laws, Mexicans crossed this route every day for 3 centuries). Crossing the Rio Bravo was the symbol that travelers were finishing the tired route, before arriving until Santa Fe (although this last portion also was the most difficult, since travelers crossed a desert called "Journey of the Dead Man" ). Well, it’s true, here we have a big potential, where tourist strategy has failed to give the visitor a clear idea of what this route meant. Fortunately, we live in the Information Age and many interesting places are find "with a click" (even if I know it sounds like a cliche). From Guillermo del Toro (Pan's Labyrinth), we learned: "there are traces of our past on Earth, visible only to those who know where to look ". Many villages, farms, mines and museums can give us a clear idea of what is the route. Visit the cathedrals of the cities; see the golden altarpieces in temples of small towns or eating peregrine gastronomy are simple examples. I can understand an average tourist complaining about the services of the Camino Real, and it’s true, we have failed making an attractive route for the tourist, but come on, if you're reading this, in this amazing forum: you're not an average tourist. I took some time to make a map with the exact coordinates of the main sites of the route (in the official UNESCO site some coordinates are wrong). I included the 60 WHS, all the sites that connect them, and the forgotten route to the north. Initially it had about 2000 points, but I ended up reducing it to 500, those on the main routes or that have historical importance or serve as an example of the ways of life of the Camino Real (I hope you don’t think that after 4 centuries there was only one route and in a straight line ). Finally, I take the confidence to make some clarifications of the visits made by other users of the community, not without mentioning that I thank them greatly for their interest in my country and the Camino Real. --- I think the tourist infrastructure is sufficient and extensive. What, from my point of view, has failed the most, does the terrible signage existing. 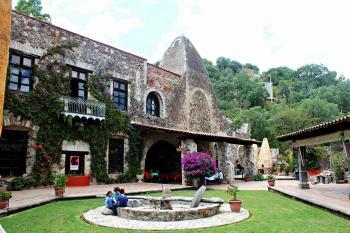 My recommendation is, if you want to visit any of the important historical centers (Mexico City, Guanajuato, San Miguel de Allende, Querétaro, Zacatecas or Durango) seek to stay in some hacienda or inn, which regularly become hotels (some expensive in the Mexican perspective, but of a regular price for the European one) or go to close sites. --- I love your comments Ian, but I think that to count the Camino Real as a visit, you have to take a little effort. To stop on three historical centers, is not a visit of the Camino Real. Alternatively, probably yes, but at least you have to try to get interested in the route: probably visit some Viceroyalty museum, some convent, some old hacienda or a section of the original road counts more as a visit. For example, if you're in Mexico City don't forget to visit the Cathedral, go up to the bell tower, go to the old Casa de la Moneda (old Mexican Mint, now National Museum of Cultures) or go to the Plaza of Santo Domingo (the place where the wagons started the journey to the North). If you visit Guanajuato, you must visit the mining complex of La Valenciana (5 minutes from the city). If you visit Zacatecas visit the Eden mine, go up to the viewpoint of the hill of La Bufa, visit some museums, which are on the old convents of the city, stay one night at Meson de Jobito, and go to the College of Propaganda Fide (10 minutes from the city), where is the official library of the Camino Real. --- I would love an extension in the future. Sites of New Mexico and Chihuahua are necessary to feel that this appointment covers the whole concept. --- As mentioned by Solivagant, the state of Durango was the main driver of the appointment; I think this has nothing to do with tourism issues. This simply has to do with the fact that Durango and Chihuahua are large states, and obviously with more sites of the route. I have always believed that if I had to choose a state that represents the Camino Real, it would be Durango. In the state of Durango, every town and city was born on a "Real", or on a Franciscan or Jesuit mission. Hooray! a visited site for practically no effort. I feel like this is some sort of cosmic repayment for all those empty European fields I've trekked to feigning interest in some rotten wood or a concrete post. My main experience of it is through four already inscribed historic centres, so it didn't really feel like I was seeing anything at all. However, sat in our hotel in San Miguel de Allende I decided to check the maps of places inscribed that weren't already part of a WHS, and found out one was less than 500m away. Sadly for anyone wanting to read about some new found remote oasis it was the church Els visited above. Our experience was essentially the same, we saw a nice church and a closed school, and well that is about it. The one place of note we have seen on the Camino Real de Tierra Adentro isn't actually part of the WHS listing, and that was its terminus in Santa Fe in the USA. It was one of the more interesting cities in that country that I have visited. I would recommend a look around if you are visiting Taos pueblo, or if you have an interest in Georgia O'Keefe. There were signs around illustrating its role on the Camino Real and it certainly felt like there was a Mexican influence on the centre. So that is about all I can say about this site, we got some idea of its previous role and the building of places to aid travellers, but on the whole I feel like I have just been given an extra tick on the list without doing much to earn it. Well, with the inscription of this site Mexico has really outdone France both in getting places inscribed twice (5 here are already on the list - Mexico City, Queretaro, San Miguel, Guanajuato and Zacatecas!) and in creating an inscription which encompasses so much of the country. No wonder ICOMOS had some “problems” with the nomination and wanted it referred for, among other matters, re-consideration of “the inclusion of the five already inscribed World Heritage properties”. The real driver behind the nomination (and various web sites show that it has been a 10 year project) seems to have come from the state/city of Durango – which happens to be celebrating its bicentenary this year. As Durango proudly proclaims “10 States are included in the project (but) Durango has 16 sites (more than any other)” - The full list is given as “Chihuahua has five, 16 Durango, 5 Zacatecas, 2 Aguascalientes, 3 Jalisco, 3 San Luis Potosi, 4 Guanajuato, 3 Queretaro and two state of Mexico” –yes I know this is only 9 states but I quote accurately – possibly the Centro Federal is the 10th! Durango’s list includes several haciendas, missions, churches towns and mines – as well as the city of Durango itself. 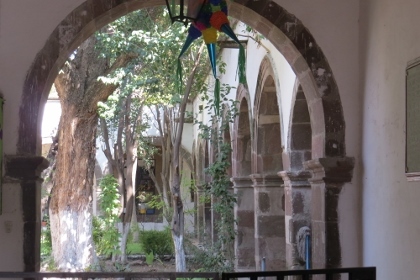 So, to make a full assessment of the site, I guess it is necessary to visit its northern parts and make one’s own decision about the ICOMOS request that Mexico “Further justify the selection of sites that make up the nomination to clearly define how they contribute to conveying the outstanding universal value of the property”. Another peculiarity about the inscription is that, although the Camino Real went from Mexico City to Santa Fe, and indeed its northern finishing point is an important part of its historical significance, none of those parts within the US state of New Mexico is included. The loss of these historic parts of their country is of course still a raw subject in Mexico which regards the US annexation of much of its territory after the Mexican-American War of 1846-8 as little short of theft! The US does “look after” its part of the route and proclaimed the “404 mile (646 kilometer) section of the route within the United States …. as a National Historic Trail on October 13, 2000”. But there seems to have been no consideration of joining with Mexico when the US was considering its new T List a couple of years back, and, unusually, ICOMOS didn’t raise the issue in its conclusion, though normally it identifies trans-boundary possibilities at every opportunity!! ICOMOS advised Referral to "Strengthen the comparative analysis ...; Further justify the selection of sites...; Re-consider the inclusion of the five already inscribed World Heritage properties; "
Linear inscriptions: It does include 4 "linear" stretches of road -some are less than 1km but there is also "Stretch of Camino Real between Nazas and San Pedro del Gallo This 64km stretch is the longest that has been preserved." (AB) It is described as a "Heritage route" rather than a "Linear Cultural Landscape"
Camino Real: "Camino Real de Tierra Adentro was the Royal Inland Road, also known as the Silver Route. The inscribed property consists of 55 sites and five existing World Heritage sites lying along a 1400 km section of this 2600 km route, that extends north from Mexico City to Texas and New Mexico, United States of America. The route was actively used as a trade route for 300 years, from the mid-16th to the 19th centuries, mainly for transporting silver extracted from the mines of Zacatecas, Guanajuato and San Luis Potosí, and mercury imported from Europe." 86 Community Members have visited.